Provide suitable custom traits struct for function pointers. Function pointers can't be directly given these traits as functions can't have their alignment computed with alignof and we need different casting. To rely on higher alignment for a specialized use, you can provide a customized form of this template explicitly with higher alignment, and potentially use alignment attributes on functions to satisfy that. 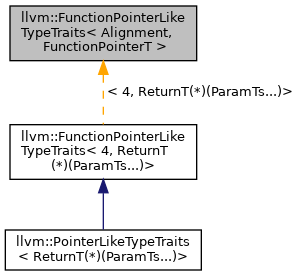 Definition at line 123 of file PointerLikeTypeTraits.h. Definition at line 124 of file PointerLikeTypeTraits.h. Definition at line 125 of file PointerLikeTypeTraits.h. Definition at line 131 of file PointerLikeTypeTraits.h.